Listen to a replay of the best of Patriots.com radio. Bill Enright and Anthony Grace break down FFChamps Fantasy Football rankings for Week 2 and let you know who to start, who to sit and the latest on the injury front. Bill Enright and Anthony Grace of FFChamps.com let you know who to start and who to sit in your Fantasy Football championship. We get you updated on all the injuries across the NFL, talk daily fantasy and more. Bill Enright and Anthony Grace of FFChamps.com let you know who to start and who to sit in your Fantasy Football semi-finals. We get you updated on all the injuries across the NFL, talk daily fantasy and end the show with our prime time pick'em. Bill Enright and Anthony Grace let you know who to start and who to sit in Week 14. We're helping you win more money on DraftKings with some advice from Andrew Miller. Plus, our primtime pick 'em. Bill Enright and Anthony Grace let you know who to start and who to sit in Week 13. We helping you win more money on DraftKings with some advice from Andrew Miller. Plus, our primtime pick 'em. Bill Enright and Anthony Grace let you know who to start and who to sit in Week 11. We helping you win more money on DraftKings with some advice from Andrew Miller. Plus, our primtime pick 'em. Bill Enright and Anthony Grace help you set your week 10 fantasy football lineups. We talk DFS and DraftKings with Andrew Miller. Plus, our primtime pick 'em. Bill Enright and Anthony Grace help you set your Fantasy Football lineups for Week 9. We take a look at the trades made at the deadline and their fantasy impact. Plus, some DraftKings strategy with Andrew Miller. Bill Enright and Anthony Grace of FFChamps.com help you set your week 8 fantasy football lineups. We break down the Amari Cooper to the Cowboys trade and take a look at the fantasy impact. Plus, get some DFS and DraftKings advice with Andrew Miller. Bill Enright and Anthony Grace from FFChamps.com let you know who to start and who to sit in your fantasy football lineups for NFL week 7. We get you caught up on all the injuries around the NFL, talk some daily fantasy football and our primetime pick 'em. Bill Enright and Anthony Grace from FFChamps.com let you know who to start and who to sit in week 6. We get you caught up on all the injuries around the NFL, talk some daily fantasy football and our primetime pick 'em. Bill Enright and Anthony Grace let you know who to start and who to sit in your Fantasy lineups. We get you updated on all the injuries around the league. Plus, our primetime pickem. Bill Enright and Anthony Grace from FFChamps.com help you set your Fantasy Football lineups for Week 4 with who to start and who to sit. We discuss the injury to 49ers QB Jimmy Garoppolo and other big injuries across the league. Plus, our primetime pick 'em. Bill Enright and Anthony Grace help you set your Fantasy Football lineups with who to start and who to sit for NFL Week 3. We go around the NFL with news and injury updates. Plus, we take a look at Josh Gordon's fantasy value now that he’s on the Patriots. Bill Enright and Anthony Grace from FFChamps.com help you with your Fantasy Football Draft. We discuss our sleepers and busts for QBs and TEs. Plus, we break down who you should target for wide receivers. With 14 days until the start of the season it is a big weekend for Fantasy Football Drafts. We discuss which players we consider sleepers and which we consider busts. In our 2018 debut, Bill Enright and Anthony Grace help you with your fantasy draft prep. We reveal our 10 commandments for winning fantasy football, injury updates around the NFL. Plus, our five NFL next great offenses.  In our season finale of Fantasy Football Champs, Bill Enright and Anthony Grace from FFChamps.com help you set your Conference Championships lineups and your DraftKings rosters with Andrew Miller from GPPMaster.com. Anthony Grace hands out his 2017 Fantasy Football Awards. Plus, we make our predictions for the Super Bowl. In this edition of Fantasy Football Champs, Bill Enright and Anthony Grace help you set your Divisional lineups and your DraftKings rosters. Anthony Grace offers his 2017 Fantasy Football Awards. Plus, we make our predictions for the Divisional playoffs. In this edition of Fantasy Football Champs, Bill Enright and Anthony Grace help you with your Week 17 fantasy championship. Anthony Grace offers his Must Play, OK, No Way players. Plus, Andrew Miller from GPPMaster.com joins us for some DraftKings rosters advice. In this episode of Fantasy Football Champs, Bill Enright and Anthony Grace of FFChamps.com get you ready for your Fantasy Football Championship. Anthony Grace offers his Week 16 Must Play, OK, No Way players. Andrew Miller from GPPMaster.com joins us to help you set your DraftKings rosters. In this edition of Fantasy Football Champs, Bill Enright and Anthony Grace of FFChamps.com get your lineups ready for the Fantasy Football Semi-Finals. Anthony Grace offers his Must Play, Ok, No Way players for Week 15. Plus, we talk with Andrew Miller from GPPMaster.com for advice on DraftKings rosters. In this edition of Fantasy Football Champs, Bill Enright and Anthony Grace of FFChamps.com get you ready for the Fantasy playoffs. We're helping you set your Week 14 lineups and your DraftKings rosters. Plus, Anthony Grace offers his Week 14 Must Play, OK, No Way players. Our guest today is Andrew Miller from GPPMaster.com. In this edition of Fantasy Football Champs, Bill Enright and Anthony Grace from FFChamps.com help you maximize your lineups for Week 13 for that final playoff push. We talk DFS strategy with Andrew Miller as he joins us to take a look at the players you want to roster to win some money. Plus, Anthony Grace has his Must Play, OK, No Way players for Week 13.